I’m so happy that you are here, reading this! That means that your life is about to change in a tremendous way. We all love music and the joy that a great song can bring into your lives. All though history, sounds have been very important to us. We use sound to communicate, both short and long distance. It’s like you can feel the energy in the air depending on how we communicate. If someone is angry then you often feel unease in some way you can’t explain. Or if someone you love whispers soft words in your ear, then you also feel a significant change in your body, right? How is this? Is it just the words we hear that gives the body a reaction? NO! The power of the sound is much more than just what you hear! If it was not for sound and resonance, you and I would not even exist! This is how powerful and important sound is in our universe! Sound works on so many frequencies, most of them that we don’t even notice. But that doesn’t mean they aren’t there, right? Quantum physics showed us over a 100 years ago that we are the maker, or creators of our own reality. So today I’m going to share with you some knowledge I received over the last couple of weeks. What can Sound & Resonance do? So I will show you a list of things that we actually miss out on that we know that sound can do for us. Most of you are probably thinking this is some kind of bad, and really late, April first joke that I’m trying to play on you. I assure you that it is NOT! And I will show you what I think is evidence enough to spark your interest for exploring this subject even more! The Bible tell us, God said, “Let there be light”. It is always the sound of the creator that comes first. Light is the consequence of the sound. It is not the light first – the sound is the precursor to the electromagnetic universe. So resonance creates light, it’s even the first words in the Bible. And what’s fascinating is that all ancient cultures and civilizations, no matter were you look around the globe, seem to have sound and resonance as its source of creation. The Egyptians tell us about the universe being “sung into creation“. The Aboriginals of Australia tell us that everything was created with “three sacred songs“. “Everything was so peaceful and silent that Vishnu slept undisturbed by dreams or motion. From the depths a humming sound began to tremble, OM (AUM). It grew and spread, filling the emptiness and throbbing with energy. The night had ended. Vishnu Awoke“. It’s basically the same thing as in the Bible, just a lot more dramatic and a lot more left to the imagination. “Vishnu awoke” or got brought to live, means that the darkness had ended. Like “God said, let there be light“. “You do not just hear sound through your ears. You actually hear through every pore of your body and this influence your entire being. It can slow down, or heighten the blood circulation and hearth rhythm. It either wakens or soothes the nerve system. It can arouse someone to greater passion or calm him by bringing him to peace. Sound becomes visible in the form of radiance. This shows that the same energy which goes into the form of sound before being visible is absorbed by the physical body. In that way the physical body recuperates and becomes charged with new magnetism“. Also, the sound of the 7 chants that are being used to balance your chakras, which are still used today throughout countless meditation and yoga practices. One of the most famous symbols in history. 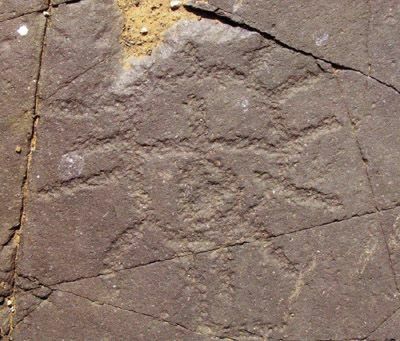 It is commonly found throughout many civilizations, as at this site at Driekopseiland in South Africa, a phenomenal example of an ankh inside a radiating circle. Much points to that is was a tool that radiates, or resonates, like a tuning fork. It creates energy that gives off resonance. Every King and every Pharaoh had his or her own personal Ankh. This tell us that there was something very special about them and the personal relationship between the individual and the Ankh. They didn’t share their Ankhs, the same way we don’t share our toothbrushes today. They said to be used to levitate large objects and also have healing capabilities. Every frequency is referred to as a prime resonance frequency, and everything in existence resonates at a specific frequency. This apply to everything from the tiniest atom, virus, molecule and so on – everything has its own prime resonance frequency and every frequency has its own specific shape. You can see for yourself in this beautiful example Video how sound manifests into physical form. The lower the frequency, the simpler the shapes, the higher the frequency, the more complex the shapes gets. This is called “Cymatics” and you will keep finding connections throughout this article to this. 1888 – Philadelphia John Keely was levitating light objects using sound. What he found out was that the technology that he was using had to be calibrated to his body. Other people tried to use it without success. They just couldn’t do it, until their bodies was calibrated to the tools and implements that brought forth the levitation. Could there be a connection between the Ankhs and the frequency or energy of the owners body and this technology that John Keely was working on? Let’s look at another thing he did with sound. He crushed giant blocks of stone, or drilled holes in to rock with absolute millimeter precision. This is something the mining industry struggling with today, and John Keely did it in minutes using just sound and frequencies. Most of his research was removed from mainstream media and the public not long after his death. Nikola Tesla in the 1900s, used the Earth as a source of energy for what he wanted to share with the world – free energy for all which would liberate the people from the enslavement of the global race towards coal, oil and gas powered industries. He used the sound and the resonance from the Earth, which he converted into a transmittable form of energy that could be used anywhere on this planet, and even in space, using the resonance of sound as a connector and a source of energy. But most people know what happened to Nikola Tesla, he ran out of money and funding. Back in 1931, this guy named Royal Raymond Rife was called – The man who found the cure for all disease. His universal microscope could see living cells for the first time, and we could see how sound and resonance affected the cells. But it was not just the cells that were effected, but viruses and bacteria as well. He started to show people how using the prime resonance frequency he could manipulate and control disease. Also, at a library in Sedona – Arizona, you can find one of his handwritten books. About 800 pages that specifically talks about the treatment for all kinds of diseases including Cancer, Diphtheria, Tuberculosis and much, much more. There is much documented about this if you want to learn more. Just watch this short documentary. In the beginning of the video they talk about Anthony Holland, a music professor from Skidmore collage and his TEDxTalk on how sound cures cancer. You can probably find a lot by doing a quick Google search of him. Peter Davey New Zealand 1940 – He tried to register a patent to boil water with sound. He spent his entire life trying to get his device and invention to the people of the world. Daveys largest obstacle was that he wanted to sell it to the world, which is the common denominator of why many of these discoveries and devices never reach the population. It’s always the money that comes in the way, one way or another. But Peter Davey started boiling water using sound as early as 1940, showing an incredible new phenomenon that could really have saved the world from an incredible pollution problem. The fact that we have to burn coal to boil the water, to create the steam, to drive the turbines, to give us electricity. This is insane, don’t you think? If only we could boil water with sound, we can create clean electricity by boiling the water, and the rest that follows. Sounds as a much better idea to me since the steam doesn’t get used up, it gets used over and over again. This could be a HUGE step forward for the world and for communities to take control of their own electricity and energy supply. When Peter Davey first brought this out in the ’40s, before he turned his device into an electrically powered gadget, he used what seems to be two normal bicycle bells -one smaller one inside a bigger one. And by simply ringing the bell, the water would boil. Isn’t that the kind of technology you would like to have in your house? I know I surely wouldn’t mind it at all. Run out of hot water? No problem, just ring the bell. ‘Ring ring’ A geyser full of hot water, coming up! I have included this short video. This is recorded for a New channel in New Zealand. Luc Montagnier – Also know for discovering HIV, stunned his colleagues when he presented this new method, detecting viral infections that bore close parallels to the basic tenets of homeopathy, and in 2011 he spontaneously generated DNA using sound, exposing an empty test tube to sound frequencies and after a certain time, DNA spontaneously materialized! Although fellow Nobel prize winners, who view homeopathy as quackery, were openly shaking their heads, Montagnier’s discoveries were quickly embraced by homeopaths eager for greater credibility. Cristal Sumner, of the British Homeopathic Association, said “Montagnier’s work gave homeopathy a true scientific ethos”. Now, DNA is a blueprint of who we are, what out bodies are. Every aspect of creation, the physical form of our body, is encoded in the DNA, so this is an incredible achievement! Because by manifesting DNA with sound, we can get to understand how we can manifest everything and anything using sound and frequencies. There is an infinite number of sub-frequencies, or fractals of the primary resonance of that frequency, which is manifesting that specific DNA that is encoded in that primary resonance of the “mother-molecule” that holds all the other information encoded in it. 2002 – John Stuart Reid invented the CymaScope which gives us the possibility to see the sound and the frequencies. And sometimes a picture, or another video can tell more than a thousand words about the knowledge and information of those that created the religious symbols that we use in our churches and monastery had. These symbols are encoded with the information that sound is the creative source. Those that came up with the logos, or the symbols for Christianity and the Coptic cross, the Pagan cross and the Knights Templar cross, are all part of ancient secret societies. They encoded this knowledge that sound is the source of creation for so many years. This truth can not be hidden, nor forgotten anymore since it is there in plain sight. Now, this is interesting. If you look at very, very large objects in space that creates or give off very low frequencies, they’ll give off very large cymatic patterns. NASA, in 2003, shared with the world that they detected supercluster galaxies being formed by sound frequencies. They said, “Sound waves 57 octaves lower than middle-C are rumbling away from a supermassive black hole in the Perseus Cluster“. Another fascinating thing is they say that this is the lowest frequency ever measured by NASA, which basically tell us that they’ve measured sound frequencies coming out of supercluster galaxies or objects in space in the past. So what they told us in this expose is if they measured in the Perseus supercluster of galaxies, billions of galaxies thrown together, about 250 million light years away from us here at earth, that this center of the supercluster galaxy resonates at a frequency of B-flat in musical terms. That’s a spectacular discovery because if we think of source of creation as being the point of everything coming into creation. Let’s take a look at the musical scale. It starts of with the letter A. The next letter, or the next frequency in the musical scale would be B-flat. It goes A, B, C. But in between each you have a note called “flat” and one called “sharp”, in this case B-flat is the frequency that resonates. Here is one connection between “God”, “Abba”, or the “Father” that brought forth everything into creation, being the source. If you take a look at this magnificent manifestation in the forming of supercluster galaxies, ringing at B-flat. In 2009 a new technology was released, known as saser technology. They call it an acoustic laser the first to emit in the terahertz range. While a laser uses electromagnetic vibrations, the saser uses sound waves composed of sonic vibrations. We could use this for much great things as well, but it’s most likely being weaponized by some governments, if it already hasn’t been done a long time ago. Lawrence Berkeley National Laboratory 5 Aug 2014 – Sound acts as a cloak of invisibility. At first, this sounded like some magic trick to me that soon was going to get debunked. But after looking into it, I found that it was actually real. That’s right. We still have energizing water & air, and also creating hurricanes & rain to look in to. The water in nature is energized by the sound as it flows trough vortexes and trough spirals as it moves. It is actually the sound in the spirals that energizes the water when we drink it. Otherwise, the water would be dead. The same thing happens to the air that we breathe. The sound energizes the air. What happens when you breathe is it makes a lot of sound. You don’t hear yourself breathe normally, but if you just put your hands and cover your ears and listen to yourself breathing, you realize that it’s a lot of noise that gets created. A very specific sound gets created by your windpipe and your trachea, all the pipes that get smaller and smaller as they go into the alveoli. So by the time the sound and the air moves through your windpipes into your lungs, it keeps speeding up and the sound becomes more and more intense. By the time the sound of the air you breathe reaches your alveoli in your lungs, it’s moving at hypersound speeds. It’s most likely moving beyond the speed of light, and this is creating a huge amount of energy. This sound and the energy generated by the sound of the air we breathe that energizes the oxygen in the air. Otherwise, it makes no sense because we breathe oxygen in and we breathe oxygen out. We don’t consume the oxygen. We don’t use it up. If we did, we’d be in a lot of trouble on this planet because there would be no oxygen left. So, oxygen in – oxygen out. We breathe it out as carbon dioxide or carbon monoxide, all depends on how sick we are. So the sound in the air that we breathe plays a critical role in us staying alive. This is actually scary that people don’t know about but in 2001, an inventor named Andrew Waxmanski got this patent approved by the U. S government. Makes you think about all the “natural disasters” that are occurring all over the world, doesn’t’t it? Just by look at this photo of hurricane Catarina and the spirals in it, you can see the vortex field that is created. Everything in our reality is a spiral activity. Why would I tell you all this? Well, this is just the first article in a series of upcoming articles about a new way of living, that will liberate and unite humanity, if we all just can see the possibilities about this new ideology called Contributionism. So I hope that I have really sparked your interest so that you keep checking in for updates to this article. Thank you for your time and please leave me a comment below. Thank you for an amazing article on the power of the sound – Free energy in frequencies. Like you, I too believe everything is energy and we are nothing more than frequencies. We all vibrate at a different frequency. Loved reading your article and looking forward to visiting your site again to read more of your interesting articles… keep up the good work! A very interesting article, I usually can’t read that long of an article and it had me going, will be reading more about Contributionism also kinda scary lol. Thanks for reading. Yeah it’s time for the people to take back the power! Looking forward to give yo more information about how this can be done. Hey Fredrik. This is by far one of the most interesting articles I have read in many years. I can’t agree more, that everything is vibration and that sound is responsible for bringing all of matter into creation. This information has been known throughout all of history by only a few at any given time. However, I think we are at a point in our evolution when many more are able to grasp this fundamental truth and use it to their advantage to evolve themselves and then contribute to making the world a better place for all beings to exist in a state of mutual love, harmony, and abundance. The cymatic pictures are stunning and I’m always left feeling excited as the frequencies rise giving birth to more complex patterns. It’s so obvious that ancient humankind did not build structures like the pyramids, Stonehenge and Macchu Pichu with forced labor. Sound, using enhancing tools like the Ankh, are the most likely explanation. For a modern example of this, we just need to look at what Edward Leedskalnin achieved from 1923 to 1951. Ed single-handedly and secretly carved and erected over 1,100 tons of coral rock to create the ‘Coral Castle. It is concerning that the knowledge of sound manipulation is known by those who have hidden agendas for mankind. You mentioned the creation of hurricanes, and this is unfortunately just the tip of the iceberg. The HAARP installations have been operating for many years now, and more recently the 5G network that is being rolled out is also capable of being used as a weapon to prevent the evolution of humanity as a species. It is up to each one of us as individuals to educate ourselves so that we raise our own vibrations and add this to the collective of awakening humans. In this way, we will triumph over the efforts of those who wish to continue to enslave us. Wow. Thank you Andrew! I’m really happy that you liked it. Share it to all you think need it, or would enjoy in. Wow. Just wow! I can’t believe I’ve never read about this. This is completely new to me and I’m amazed by all you know! I’ve bookmarked this to see more of what you dive into because this had me engaged. Now I’m curious lol. That video of the sound waves creating all those images was amazing! I live in Arizona and might go check out that book in Sedona. Thank you for your knowledge! Hello Niko! Thank you for reading this article. I’m really happy that you liked it. I am working on the next article to follow this one right now. It will be published probably this weekend. If you are in to ancient civilizations, you should defiantly keep looking in to sound and resonance. I recommend you to get a account over at gaia.com. First 2 weeks only $0.99 then $9.95 I think. Thanks for the positive review and let me know if you ever went to Sedona looking for that book. Wow! I cannot wait to read the series on sound! I truly believe sound and vibration flow through out our bodies and give us energy. Very interesting post on the history of sound in the different religions, science and technologies! It is nice to know NASA can detect other galaxies only using sound waves. That is quite incredible. I did not know there could be so much done with sound. I only thought sound could be utilized in music, but I guess not. I do have a question though. Is there anyway to use music to increase my productivity? From what I read of your article, it seems that sound can have a big impact on our day to day lives. It’s just most people do not realize it. Hello Alex and thank you for your comment. It is incredible what sound can do! Actually, you can use a lot of different techniques when it comes to improving your productivity with sound. I use the combo of meditation with chakra mantras. (sounds like AUM, YAM, RAM etc.) A couple of days a week I also use binaural sound to boost the effect of my meditation. There is a lot of music too that have binaural sound in it. You could search on spotify and you will probably find some lists saved. Use in-ear plug headphones for the best effect. The way it works is that two different frequencies are sent out, one in the left ear piece, and one in the right ear piece. What this does is that your brain find the difference between those frequencies and puts you into different kind of states (Alpha, beta, theta or gamma). There are lots of apps and programs out there. If you are prepared to spend some money, I read this great article about the Raikov Effect. I think its about $130 with a lifetime guarantee so that might be something to check out. I will when I can afford it for sure! Thanks again and let me know if I can help you any further! Wow! This was truly a fascinating article about the power of sound! I did know this to some extent, but now I´m totally mesmerized! It´s so true though when you say that money is a huge obsticle when it comes to incorporating sound into our money driven ways of living. One thing that comes to my mind reading your article is the stories of the past about female opera singers making glass shatter. I wonder if we have any living opera singer who can do this today? Do you know? That is certainly a great proof of what sound can do, right?! Hello Marianne and thank you for your comment. Money is the problem always. If we could remove money, all our problems would soon be solved. I have heard the same thing but I don’t know if there is any today. Yes, it’s a great example of what sound can do! Fascinating article. No matter what you believe our existence here is just so amazing and crazy it’s just hard to wrap your head around it. I’ve really been interested in sounds and the effect it has on is since I’ve had kids. I say this because we used white noise a lot and it just blew my mind the effect it had at calming them down.